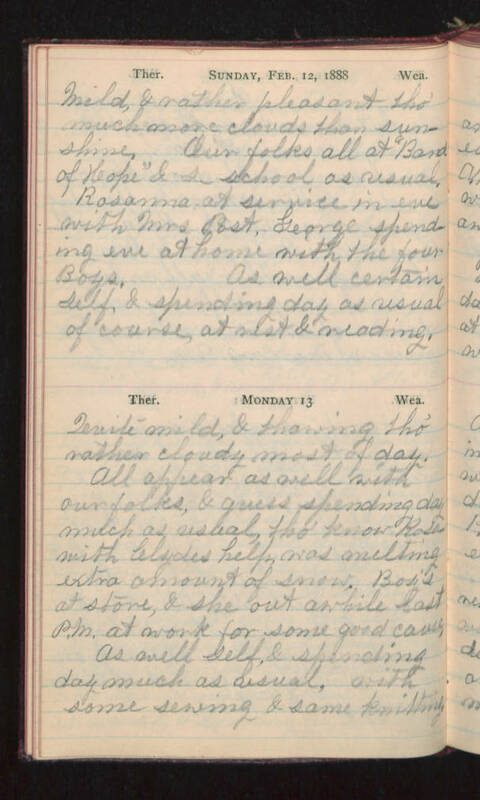 Sunday, Feb. 12, 1888 Mild, & rather pleasant tho' much more clouds than sunshine. Our folks all at "Band of Hope" & s-school as usual. Rosanna at service in eve with Mrs. Post, George spending eve at home with the four Boys. As well certain self, & spending day as usual of course, at rest & reading. Monday, 13 Quite mild, & thawing tho' rather cloudy most of day. All appear as well with our folks, & guess spending day much as usual, tho' know Rosa with Clydes help was melting extra amount of snow. Boy's at store, & she out awhile last P.M. at work for some good cause. As well self, & spending day much as usual, with some sewing & some knitting.